now come up with a new service called Coach Mitra facility. 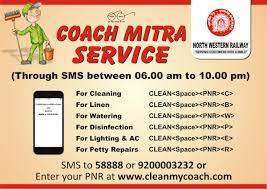 Coach Mitra or Clean My Coach scheme is a single-window passenger support platform that allows them to place journey-related complaints on-the-go either via SMS, or through a designated app or website. Using the service, one can place complaints with regard to issues in facilities like watering, cleaning, disinfection, lighting, repairs, toilet cleaning, linen, among others. Notably, the service is now available in 2,167 trains. To place a complaint via SMS, type CLEAN (space) Your 10-digit PNR number (space) Service code, and send it to 58888 or 9200003232 between 6 am and 10 pm.